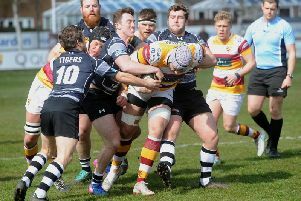 Head coach Warren Spragg is making no attempt to play down the importance of Saturday's home clash with Hull Ionians in Fylde RFC’s bid to climb off the bottom of National League One. Eight successive defeats have left Fylde 10 points adrift and 22 from safety with nine to play. They probably need to win at least six to have any realistic chance of avoiding relegation, though victory over an Ionians side who have lost seven of their last eight would be a start. Spragg told The Gazette: “We still have to play the four teams immediately above us at home. Hull is the first of those and to give ourselves any chance we have to win. Spragg is hoping any lapsed supporters will return to offer vocal support on this critical weekend, saying: “The crowds have dropped off, which doesn’t surprise you when you are losing games. The coach rejigged his back division at Coventry, moving Alex Dolly to half-back alongside Greg Smith, welcomingback James Bailey on the wing and putting Tom Carleton to full-back. He was encouraged by the new-look backline, which will be further boosted by Chris Briers’ return from a broken arm. Spragg added: “Dolly did well at nine. His kicking was quite smart and I was pleased with his distribution.